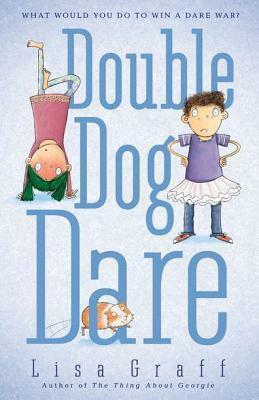 Double Dog Dare is the dual story of 4th Graders Kansas Bloom and Francine Halata. Kansas is new to school and was known in his former school as the “King of Dares.” This moniker doesn’t mean much until a spot opens up in Media Club for a new news anchor. Francine and Kansas tie for the coveted job. In an effort to break the tie Kansas and Francine embark on a Dare War–one point for each dare successfully accomplished and whoever earns the most dare points will become the new anchorperson for morning announcements. Unknown to each other, both Kansas’ and Francine’s parents are going through a divorce. The premise is weak and the first several dares are lame in content and wholly uninteresting in the storytelling. The first 80 pages or so are bland and unremarkable. I almost put this book down without finishing it. I am glad that I didn’t because the second half of the book came alive and finished at a decent pace. The characters of Kansas and Francine both began to sound like real kids about a third of the way into the story. I became interested in their dares when the dares became secondary for both of them. It is at this point that they start interacting with each other and with their respective parents (and sister–in Kansas’ case). This is the point at which I started to care about them as people. Graff’s older-age books such as the terrific The Thing About Georgie do not suffer from this clunky plot beginnings issue but her other young reader novel Sophie Simon Solves Them All For You (which I enjoyed AFTER the first few chapters) does. The verdict on Double Dog Dare is that if young readers can hang in there through the first several dares, the pace and the plot pick up speed and energy, resulting in genuine complications, a few well-choreographed slapstick events and an authentic expression of kids’ views and feelings in the midst of a divorce. The ending, while not spectacular, is ultimately satisfying. This could definitely be a worthwhile read for 3rd or 4th graders.